I thought I'd share a simple idea we use with our 6 year old to make the most of his time during the preaching service of our church. I've designed a sheet in MS Excel with blanks for the sermon notes - things such as Sermon Title, Preacher, Date, etc. (most of this info is found in our church bulletin). Then, I list 20 blanks for 20 words or phrases that he is to write down during the sermon. 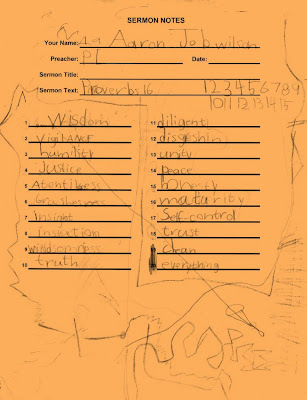 The notes above are for a sermon that our pastor preached from Romans 12:4-8 (listen here, search by date or text). We try to discourage him from writing words like "the" or "he" or "God" - you know, frequent words; but rather to listen for key words or phrases. He's still not catching all the "key" words just yet, but this is a start. Speaking of starts...we didn't start with 20 words. Here's how it progressed for us: at the age of 4, our church no longer offers child care during the evening service. So, at least twice a month, Aaron Job would sit with us during the evening service (on 2nd & 4th Sundays, we meet in small groups around our city). This is a good & gradual adjustment to "big church". We have our 4 year old daughter coming in on Sunday evenings now as well. For Sunday morning worship, five years is the transition age from children's worship to "big church". So when he turned five, he began attending the main worship service with us each week. We also will bring some of our children in during special services - missions, choir concerts, etc. as another way of slowly getting them accustomed to sitting with adults (our children's worship is also designed to prepare the children for this transition). Once Aaron Job began to learn to write (I think it was when he was five...that's something my wife would remember) I would make a simple list of just five blanks for him to write words. Soon it grew to 10 words, then 15, and finally 20 (you should've seen the faces he made each time I'd increase the number of words!). Gradually, I hope to train him to listen for outline points and other key words & phrases. Here's a list of 18 characteristics of a godly man found in Proverbs 16:16-33. The list was easy to follow, so I had Aaron Job listen for the 18 characteristics. He got them all (with a little help from mom & dad) and even included two extra at the end. Of course, in his mind, the goal is to finish as soon as he can, so he can work on what he hopes will become blog fodder. To get you started, you can download my form here for your own use. Of course you can customize your list to meet the needs of your children. Our church offers childrens' classes through third grade during the service and so my daughter will be in service with us next year! 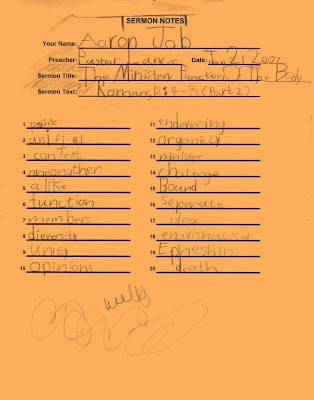 We used to attend a family integrated church, but she was too young to take actual notes like this when we were there. I am going to make up my own page and incorporate your idea.